I have very fond childhood memories of gingersnaps that came in tall cylindrical tins that were crisp and sweet and most of all, gingery. It must be a generational thing, because most folks in the forties and older seem to recall this cookie, one of just a few commercial cookies at the time. I don’t even remember the manufacturer or the name of the cookie, just the actual cookie. They were a favorite of my mom and dad, and I recall that they weren’t an everyday treat. So with the recent bounty of ginger in the house, I figured I should attempt to replicate the gingersnaps of my childhood. 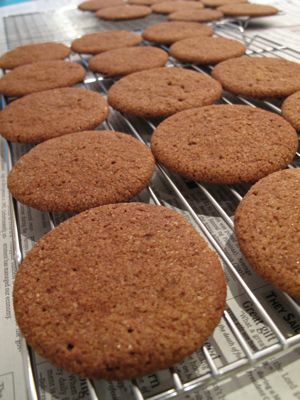 It wasn’t that easy to find a good sounding recipe, but leafing through a cookbook entitled “The Sweet Life, Desserts from Chanterelle” by Kate Zuckerman, amongst many elegant sounding restaurant quality desserts, she had a recipe for a basic gingersnap cookie. I immediately checked to see if we had all of the ingredients and went about the happy task of baking up a batch. To my and Mrs. MM’s disappointment, the first attempt came out a bit chewy and while very flavorful, they lacked the essential snap. The Teen, on the other hand, prefers softer and chewier cookies, so she thought they were the cat’s meow. This recipe should make roughly 40 cookies, depending on low large or small you make them. Cream 17 tablespoons (1 cup and 1 tablespoon) of butter at room temperature (65F) in a mixer for about 1 minute, then add 1 and 1/4 cups of brown sugar (lighter not dark muscovado) and cream this further for 6-7 minutes until well incorporated and the butter is lighter. Add two large eggs at room temperature, one at a time, and mix well. I used a kitchen aid mixer with paddle attachment, you may need to adjust mixing times with a less powerful mixer. In a separate bowl add 2 and 1/4 cups flour (I used unbleached all-purpose flour; bleached should be okay as well), 2 teaspoons baking soda, a large pinch of salt, 2 teaspoons powdered ginger from a FRESH bottle, 1 teaspoon of ground cloves (from a FRESH bottle), 2 teaspoons of ground cinammon, and about 1-1.5 tablespoons of shaved crystallized ginger. I just used a hard cheese grater to shave the crystallized ginger. 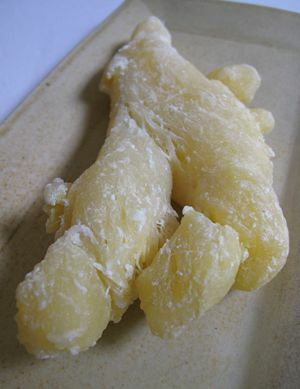 If you make your own crystallized ginger, it may not be as dry as the one in the photo below, so just mince it finely and add it to the flour mixture and whisk everything together until well incorporated. When the butter, sugar and egg mixture is ready, all the flour mixture and mix on low speed. Add 1/4 cup of unsulphured molasses and keep mixing until just incorporated. Take the bowl out of the mixer and use a rubber spatula to ensure that everything is well incorporated, then cover the bowl with plastic wrap and refrigerate this for 2.5-3.0 hours. If you live in a cooler climate that Manila in the dead of summer/rainy season, then chilling for 1.5-2.0 hours should suffice. Pre-heat the oven to 350F, then line your baking sheets with parchment paper or silpat mats, take the batter out of the fridge, and add a rough tablespoon to your palm and roll it into a ball, then roll it in a plate filled with white sugar (better if you can find crystal or large grain sugar, from bake shops) and place it on the pan, patting it down a little. This part is one of the keys to a good final product. Don’t be tempted to make the cookies TOO BIG. And don’t flatten the ball too much, they will naturally spread out. Stick this in the oven for roughly 13-15 minutes, turning the pan around to cook them all evenly. Don’t undercook them, and don’t burn them either. It may take a pan or two or three for you to gauge the right amount of time in your oven and given your choice of cookie size. The black ribbon makes them a sober, elegant gift. Love them with cold milk. But can’t get Ginger cookies anywhere in Cebu anymore. Not even the tinned ones. Whenever I mention them, people look at me like I’m weird or loko or something. And I don’t have a good recipe for them either. Don’t know where to get good Ginger. Ging : have you tried Marks & Spencer? What has happened to those commercial gingersnaps (weren’t they made by Nabisco?)? Those were one of my favourite supermarket treats, and my mom would always buy a tin for us. I can’t find them anymore. But luckily the grocery stores in HK have a gingerbiscuit (not too snappy, but quite gingery). MM, what if you used the trick of letting the dough rest for 12 to 24 hours like the chocolate chip cookies? I noticed that when I used that NYTimes recipe last year, the cookies came out crunchier. wow, such professional-looking cookies! makes me want to bake up a batch today. in the 70s to the early 80s, there was a big local (davao) cookie factory (7M biscuits) that made really good stuff, and one of our favorites was their ginger cookies that came in tin cans. too bad they closed after a prolonged labor dispute. Oh MM, Diet Coke and aspartame. Take heed! Michael Fox, the actor, was diagnosed to have Parkinson’s disease at an early age, 30 years. He was a spokesman for Diet Pepsi and was supposedly addicted to the drink. Medical literature cites environmental toxins as one of the possible causes of PD but does not identify aspartame specifically as one of them. To be close and personal, a family member who drinks 5 cups of coffee a day, each cup with 3-4 packets ( about 20 packets total per day) of artificial sweetener for most of his life was recently diagnosed to have Parkinson’s. He is in his late 60’s, with over 40 years of exposure to artificial sweeteners. There are other claims in popular literature about association of neurological and other conditions with aspartame. Whether exaggerated or not, they are difficult to ignore especially with the power of Big Pharma: see links below, for whatever its worth, but it pays to take heed. I used to buy the Nabisco gingersnaps too! At least when I was a teen ager. Then I learned what recipe I liked which I got from David Lebovitz site and sugared my own ginger. Soo much better than Nabisco. I like them real snappy, spicy (cloves, nutmeg, allspice, cinnamon, ginger powder), gingery (minced candied ginger) and molassesy. =) The recipe by Maida Heatter includes some mustard powder and black pepper but they weren’t strong when I tried her recipe. 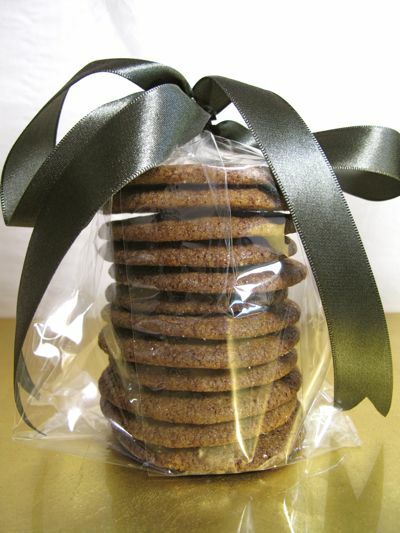 i don’t care much for gingersnap cookies (i don’t like the taste of ginger in my sweets) but i so love your black ribbon and cellophane packaging, sans bilao. Hahaha. Funny how the packaging got as much notice as the cookies. The bilaos were brought to a wake. Hence the need to be opened up and accessible to people reaching for a snack. The cylindrical version is in a clear glassine bag. And the ribbon is actually a dark grey brown. Connie C, yes, I weigh the risks of artificial sweetener and given that I don’t smoke and don’t drink and try to eat mostly good food, it is my last vice as it were. MM, Tapping the pan on the counter, when you take it out of the oven, releases the air/steam trap under the cookie. This will help in minimizing the cookie going soft. After 5 minutes (yes, we rest the cookie too!!! hehehehe) transfer to wire rack to cool. Ging, let me look thru my recipes for gingersnap cookies. I know have a good one somewhere. 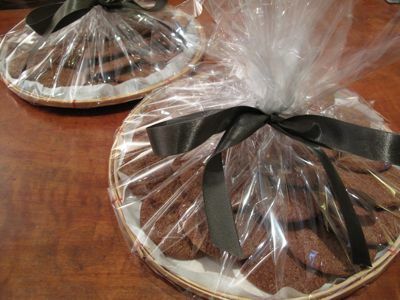 glassine and dark grey brown satin ribbon, so martha stewart. love it. Incidentally, The kitchenAid celebrates its 90th birthday this month. Talk about staying power!! Ging, La Marea in Crossroads has wonderful gingersnaps. When we were children, my mother was the BEST cookie baker in Cebu (we thought so, anyways) and gingersnaps were a staple in our kitchen. Maybe her being American had something to do with it but she was a prolific cookie producer! 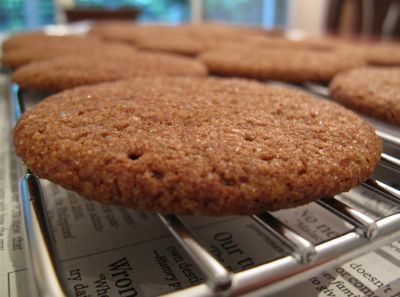 The gingersnaps in La Marea are the closest to a perfect childhood memory that can be reproduced. I don’t know if they have them all the time but it is worth checking…the other cookies are all old-fashioned and still baked in small batches in a home kitchen. Artisan Chocolatier, have you seen the new flat beater for the Kitchen Aid that comes with a rubber scraping implement already attached? It eliminates having to scrape down the bowl as it does it continuously. Ingenious! Ging, I can attest to the baking prowess of Susie’s mom. I had the privilege of trying her different cookies growing up and somehow its stamped in my brain as the standard to good cookies. Susie’s aunt and uncle are also awesome culinarians!! Susie, I actually had them in some bigger commercial machine and am glad kitchenAid has finally incorporated it in theirs. Small, crunchy, packed with flavor… Doesn’t even matter to me that it’s gluten-free, it’s just reallllyy good. I ate a whole bag in one sitting, easy :) Love ginger snaps. thanks so much! i forgot that la marea has them. i always get the sesame seed cookies and the cakes :-)have not been visiting lately because of my horrific weight gain. thank you! maybe ginger snaps are less calorific than the crisps? thanks for the recipe MM! These are my favorite! This post made me beg my husband to go to our local grocery store here in NY, Food Emporium, mins. b/f closing time at 10pm and grab any ginger snaps he could find. They were Nabisco and a little too crunchy but they hit the spot! i love gingersnaps too! the last time i saw (and bought) gingersnaps was sept. ’08 in cash and carry makati. yes, from nabisco or fibisco, the same company that makes the choco chip cookies. Kate Zuckerman is the niece of Nikki’s best friend Miriam, and now runs a catering service as well as being a dessert chef. Hi Marketman, where do you buy your unbleached white flour and crystallized ginger? Healthy Options? I’m currently on the hunt for unbleached white flour that doesn’t cost an arm and a leg (as what Healthy Options charges). Thanks! I love gingersnaps! There is a local company (FiBisco?) that makes them but I rarely see it in the groceries. Of course, I hoard it when I get to see them. Fibisco aside, is there anywhere else in Manila that one can get scrumptious ginger snaps? you can still buy the Fibisco Gigersnaps…i see it in Landmark. looove gingersnaps!!!! If given a choice I’d grab the gingersnaps than choco chip cookies. Oh anne thanks for the info on where to get the Fibisco GIngersnaps, been looking for it for ages. Will be dropping by Landmark just to buy it. Chica, sorry, I can’t recall the brand of flour, but last I checked, they were out of stock. They have it at Healthy Options sometimes, but pricey. Oh, and yes, I bought it in the Metro grocery at Market!Market! IN MY OLD DAYS IN FT. COLLINS, COLO. YOU COULD BUY A SACK FULL OF GINGER SNAP COOKIES FOR A NICKLE. WHY WERE THEY SO CHEAP. THE HOME BAKERY THERE MADE JUST SO MANY COOKIES EVERY DAY AND TOOK ALL OF THE LEFT OVER DOUGH AND MIXED IT TOGETHER AND ADDED A LARGE AMOUNT OF GINGER TO IT. HE SOLD THE COOKIES BY THE BARREL TO GROCERY STORES. THE STORES PROMOTED THEM. 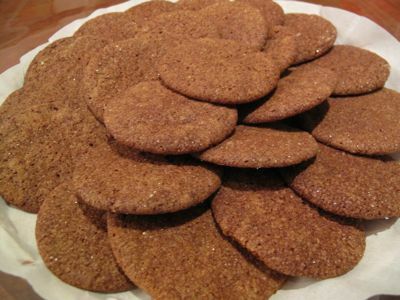 WHEN EVER WE COULD GET A NICKLE WE WOULD GO TO THE STORE AND LOAD UP A SACK OF GINGER SNAP COOKIES.